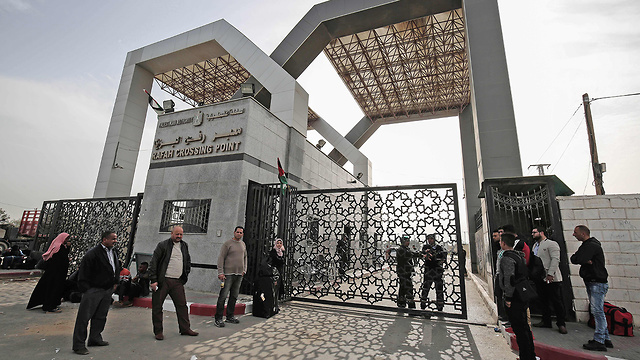 Egypt has opened the crossing during the month of Ramadan easing a border blockade of Gaza that it has enforced, along with Israel, for the past 11 years; Hamed al-Shaer encountered difficulties while attempting going back to Saudi-Arabia where he has been living for the past 13 years, after visiting his family in Gaza. Just after daybreak, Hamed al-Shaer came down the narrow stairway of his family's home in southern Gaza pulling a black suitcase and said goodbye to his mother. They hugged at the gate and he kissed her hands in a show of devotion as she struggled to control her emotions. Most Gaza residents can't travel at all under the strict blockade imposed after the Hamas terror organization seized the territory in 2007. In recent weeks, anti-blockade protests on the Gaza-Israel border—organized by Hamas, but driven by the despair of Gaza's residents—have drawn new attention to the hardships faced by Gaza's 2 million people. The high casualty count during the protests—more than 100 Palestinians killed and more than 3,600 wounded since late March has lent new urgency to international efforts to improve conditions in Gaza. Egypt promised to reassess its closure policy after Ramadan, raising the possibility of letting goods into Gaza as part of any UN-led projects, the Hamas officials said, speaking on condition of anonymity because they were not allowed to discuss back-channel contacts. In September, he returned to Gaza for a visit because he missed his parents, who wanted him to marry a local woman—which he did in December. On Sunday, al-Shaer was at the departure hall, waiting his turn. He kept checking his phone and pacing up and down as Hamas officials—sitting behind a counter and separated from the crowd by a fence -- called out names. Some travelers waved papers, hoping to get the officials' attention. On Wednesday morning, he left his parents' house in the town of Khan Younis at about 6:40 am. Four hours later, he had reached the Palestinian side of the Rafah crossing and got his passport stamped. By noon, the bus arrived at the Egyptian side of the border. This time around, his trip through Sinai took more than 13 hours. At 8:30 pm, al-Shaer finally crossed the Suez Canal, his bus bound for the airport, where he would try to book a flight after the tiring journey. Al-Shaer said he left Gaza with mixed emotions—glad he spent time with his parents and found a wife, but railing at the steep price. "You may lose your residency, job and future—sacrifice all of that just to see your family," he said. See all talkbacks "In Gaza, border opening brings relief and anxiety"